David Ortiz, known worldwide as “Big Papi” will call it a career after 20 MLB seasons. 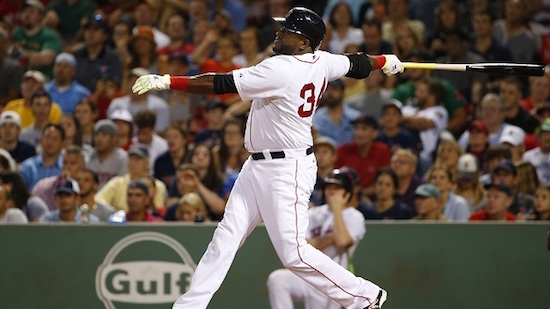 They call him “Big Papi,” and when you mention that name, people know who you’re talking about. He is David Americo (Arias) Ortiz, the larger-than-life designated hitter for the Boston Red Sox for the past 14 years. After being signed as a 17-year-old infielder by the Seattle Mariners, Oritz’s career began simply enough as the player-to-be-named-later in a 1996 trade between his original organization and the Minnesota Twins. Can you name the player he was traded for? Keep reading for the answer. It was with the Twins that Papi first made his mark in Major League Baseball. As a September call-up during the 1997 season, Ortiz impressed early with a .327 average in only 51 plate appearances. However, his tenure with the Twins (from 1997 through the 2002 season) was marred by several injuries and general inconsistency. Things seemingly begin to fall in place for him during his final season in the Twin Cities in 2002, when he helped the Twins reach the post-season with 20 home runs and 75 RBIs. However, when the Twins could not find a taker for him during the off-season, they decided to just outright release him*. He was yet another in a long line of baseball prospects that fell victim to the business. *Ed. — Ortiz was cut in order to make room on the Twins’ 40-man roster for Rule 5 draftee Jose Morban. Now, go win a bar bet somewhere with that. Just before Spring Training 2003, the Red Sox decided to take a flier on him. The 2003 roster for the Red Sox was filled at every position, but they needed more pop from the bench. So Ortiz made the cut and was on the Opening Day roster for a team that would go on to the post-season, but fall just short of breaking the Curse of the Bambino. Ortiz wasn’t used much during the first two months of the 2003 season, as Jeremy Giambi was getting the bulk of the playing time at the DH. Jeremy. Giambi. Then, on a Sunday night game airing nationally on ESPN in late April, Ortiz pinch-hit for Giambi and cranked a solo home run in the top of the 14th inning to break a 4-4 tie against the (then) Anaheim Angels. Ortiz would start seeing regular playing time after that, and Giambi would find himself out of work soon after. Overall in 2003, Ortiz would finish with a .288 batting average with 31 homers and 101 RBIs. He would also have a clutch two-run double in Game 4 of the ALDS against Oakland, a Red Sox series-tying win en route to a Game 5 win, followed by a seven-game loss in the ALCS to the New York Yankees. Papi launching a home run, as much of a tradition as Fenway Franks. The post-season is where Papi made his name synonymous with the term clutch performance, which would never be more true than the 2004 post-season. In the regular season, he would hit .301 with 41 bombs and 139 RBIs, but those numbers are only great personal stats compared to the yeoman’s work he pulled out in the post-season against the Angels in the ALDS and then the Yankees in the ALCS. Ortiz hit a walk-off home run in Game 3 of the ALDS to send the Sox to the next round, where both Big Papi and the Red Sox would make history. With the Sox trailing the Yankees three games to none in the series, Game 4 went to the 12th inning, where Ortiz would walk it off with a home run off Paul Quantrill to keep the Sox alive. Then in Game 5, Ortiz would deliver another walk-off with a RBI single in the 14th inning to send the series back to New York, with the Sox still trailing 3-2. Ortiz wound up going 12-for-31 in the series with three home runs and 11 RBIs and would be named ALCS MVP when the Sox came back for the miracle series win.The Sox would end up breaking the “Curse of the Bambino” that year, sweeping the Cardinals to win the World Series. It was the first Red Sox championship in 86 years, but far from the last of Big Papi’s Beantown career. For the 2005 season, Ortiz would finish second in MVP voting behind Alex Rodriguez, but it couldn’t translate into a repeat of 2004, as the Sox would lose to the eventual champion Chicago White Sox 3-0 in the ALDS. The next season was a wash for the Sox, as various injuries and inconsistency kept them from contending, but it was a year of personal accomplishment as Papi wound up with a career-high 54 home runs, setting the Red Sox single-season record. In 2007, the Sox won the AL East, swept Anaheim, then squeezed by Cleveland in the ALCS on their way to a World Series sweep over the upstart Colorado Rockies. It was the second ring for Papi, who hit .333/.412/.533 with three doubles and four RBIs in the series. Beginning with the 2008 season, Ortiz would suddenly become known as a slow starter, making Sox fans and media alike wondering if his days in Boston were numbered. In the 2009 season, he wouldn’t hit his first home run until May 22. In 2012, he suffered an injury to his Achilles tendon that had him missing all of September, as the Sox careened to a last place finish. However, Ortiz would regain his form in 2013, especially in the ALCS against the Tigers. In Game 2, with the Red Sox trailing 5-1, Ortiz came to bat with the bases loaded in the bottom of the 8th inning. With Joaquin Benoit pitching, Ortiz cranked a frozen rope liner toward the Fenway bullpen in right field, sending the ball and Detroit outfielder Torii Hunter over the fence, tying the game 5-5. The Sox would go on to win that game and the series, en route to their third championship in ten years after a six-game World Series triumph over the Cardinals. 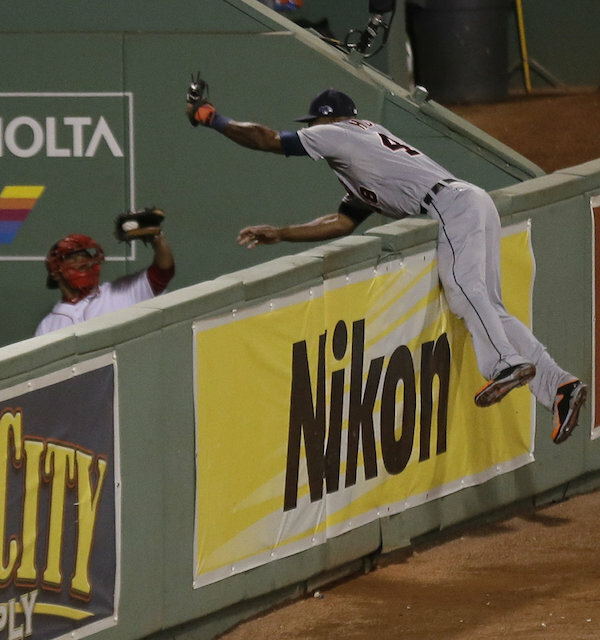 Tigers outfielder Torii Hunter, about to flip over the right field fence in Fenway, as Papi’s grand slam ends up in the bullpen catcher’s mitt. As the Red Sox push toward the post-season once again this year, Ortiz is at the center of it all. After the 2015 season, Ortiz announced that this season would be his last. So of course, Papi has gone out in style, posting one of the best final seasons ever recorded. As of this writing, he is hitting .321 with 37 homers and 124 RBIs. He is as dangerous now, at age 40, as he ever has been. However, Ortiz is more than stats to Red Sox fans. He has been the face of the franchise over the last 14 seasons. He is considered the “Godfather” for incoming Dominican-born players, as they look up to him as a player and a mentor. Ortiz has, in turn, taken many of them under his wing. There are not many players that can say anything bad about Papi because he is one of the friendliest, most outgoing, most engaging personalities in the game. By the way, that guy Ortiz was traded for, when Seattle sent him to Minnesota? None other than Dave Hollins, a useful-but-ordinary third baseman who played for seven teams over a 12-year MLB career. Despite his highlights, Ortiz is not without his share of controversy. In 2003, Senator George Mitchell led an investigation into the use of performance-enhancing drugs in baseball. This investigation was compiled into a report that was released in 2007. Two years later, it was reported by The New York Times that Ortiz was named in the report, but it was not known what substance he had tested positive for. MLB has gone on record as saying that any player that appeared on the list did not necessarily test positive for PEDs. Ortiz has stated that he was not aware of anything he had taken that would result in a positive test. In his defense, certain legal supplements that were once available over-the-counter could result in a positive test. The test failure has done little to damage Big Papi’s reputation, though. Whether one believes David Ortiz has cheated or not, it should also be noted that since more stringent drug policies and testing processes have been in place, Ortiz has never tested positive. 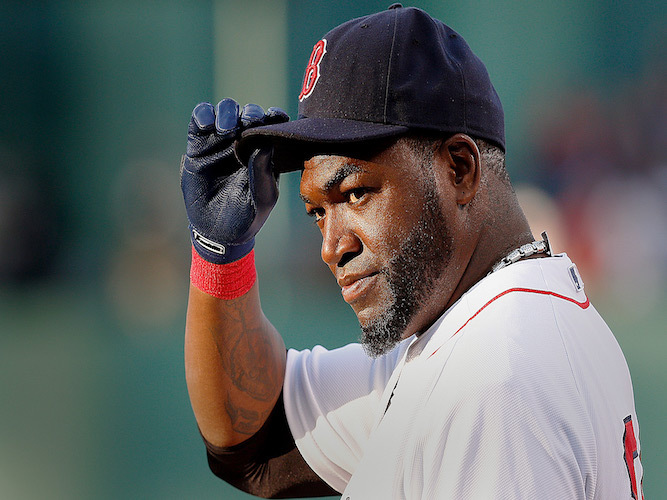 In a sport where a former MVP in Ryan Braun has been busted, and Rodriguez made into the poster-child for cheaters, David Ortiz has had to face questions about his own possible closet skeletons. It could be the media grasping at straws, or there could be some merit in questioning Papi’s morality. Or a combination of the two. Through it all, though, one thing has been for sure: David Ortiz has remained a popular figure among his peers and among fans of baseball. When he steps off the field for the very last time and 2017 rolls into town, Red Sox fans are going to miss him greatly and there may not be a replacement for his infectious smile among the Fenway Faithful for quite some time. Check out Chris' recap blog, Grudge Match, over at wrestlingrecaps.blogspot.com. He also has a site devoted to some awesome movie reviews at www.retromovienerd.com.